Nowadays, we expect to find a smartphone app for almost every purpose. But, finding a mobile video downloader that actually works, is quite a herculean task. Both Google Play and the App Store have certain policy restrictions in place, which prevent the publishing of such apps. Though there are some web apps that might serve the purpose, most of them aren’t feasible enough for mobile downloads. You may also find apps from third party repositories, but then again, these sources can seldom be trusted! However, in this article, we’ll be exploring an Android app that is both trustworthy and also provides a decent experience for downloading videos from the web. This particular app comes from KeepVid, the popular web based video downloading service that has been serving users for almost a decade. 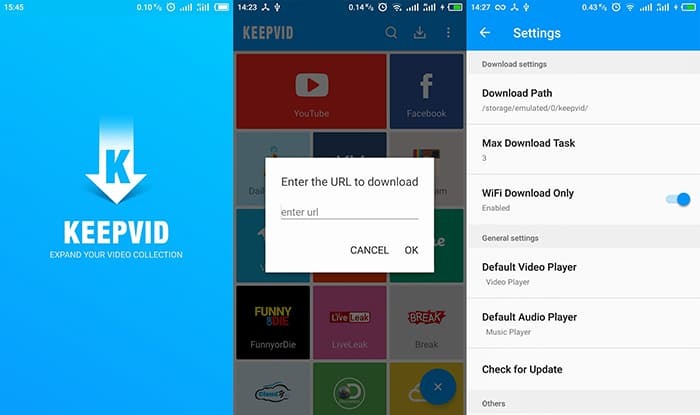 KeepVid for Android enables you to download videos from over 25 popular media streaming sites & social media platforms. It consists of a built-in mobile web browser that is able to grab videos from supported URLs and download them to your Android device. For a few of the supported sites, you can download videos in multiple resolutions, up to HD 1080p or 1440p in some cases. Due to Google’s policy restrictions, KeepVid for Android isn’t available on the Play Store. Instead, you can get the official version of the app from the KeepVid website or third party app stores, like Uptodown, as APK download. The app needs to be side-loaded on the device by running the APK package, after enabling the “Unknown Sources” option (Settings >> Security >> Unknown sources) from the Settings menu. Once installed, there are multiple ways to download videos from supported websites. You may either open the video URL directly within the in-app web browser, or just copy it from whatever (supported) app or website you’re on. KeepVid automatically fetches links from the device clipboard, and allows you to open them using KeepVid’s in-app browser, by tapping the relevant notification. The in-app browser includes a download button, the position of which depends on the particular website. For a few websites, the download button appears at the bottom right corner of the screen, while for a few others, it appears at the top right corner of the video frame. Clicking on the button reveals a list of available resolutions to download from, and tapping on a particular resolution starts the download in the selected video quality. In our tests, the download button that’s supposed to appear on the top-right corner of video player, was not available on certain Android models. This has been officially identified as a device-specific compatibility issue, and the project team is actively working on fixing such issues. If you face a similar situation on your Android device as well, just reach out to the official support team at mobile@keepvid.com. The current version of the app is free and ad supported. But KeepVid also plans to release an ad-free Premium version of the app later this month, that’s going to include exciting features, such as support for 2K videos, with more powerful features to follow in upcoming releases. Disclaimer: This article aims to serve as a knowledge base for downloading videos from certain websites on Android phones and tablets. However, downloading and distributing copyrighted content from these sites without appropriate permission may be considered as an illegal act. It’s the user’s responsibility to obtain appropriate permissions before downloading or distributing such content. 7labs may not be held responsible for any misuse of the information provided in this article.